Russia's President Vladimir Putin, left, shakes hands with Japan's Prime Minister Shinzo Abe at a plenary session titled "The Russian Far East: Creating a New Reality" at the 2017 Eastern Economic Forum in Vladivostok, Russia, Sept. 7, 2017. Russia is increasingly advocating an arms control strategy to accept North Korea as a nuclear state, disagreeing with the United States and its allies, and even to a degree with China, which all support applying sanctions to force Pyongyang into denuclearization talks. While meeting with South Korean President Moon Jae-in in Vladivostok, Russian President Vladimir Putin Thursday again urged for dialogue to resolve the North Korean nuclear crisis, and said whipping up military hysteria around the North Korean crisis was counterproductive and could trigger a global catastrophe. He also said it is not possible to resolve the North Korean crisis with sanctions and pressure alone. Echoing the sentiments of the Russian leader, Alexander Nikitin, the head of an academic institution run by the Ministry of Foreign Affairs of Russia, told an international defense forum in Seoul Thursday that the time has come to stop seeking the “immediate denuclearization of the DPRK (Democratic People's Republic of Korea) and instead pursue "realistic and verifiable” arms controls talks. “Sanctions, the limitation of food supplies, a limitation of fuel is not a method to bring North Korea to the negotiation table,” said Nikitin, who is director of the Center for Euro- Atlantic Security at Moscow State Institute of International Relations. The Russian academic suggested treating North Korea like India and Pakistan, two countries that were given sanctions waivers by the U.S. in 2001, even though they openly tested nuclear weapons and refused to sign the Nuclear Non-Proliferation Treaty (NPT). Under the NPT, only the United States, Russia, the United Kingdom, France, and China are permitted to possess nuclear weapons. 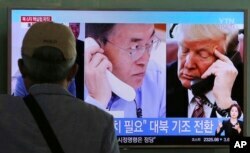 A man watches a TV screen showing U.S. President Donald Trump, right, and South Korean President Moon Jae-in during a news program at the Seoul Railway Station in South Korea, Sept. 5, 2017. North Korea has now conducted six nuclear tests in the last decade, more than 20 ballistic missile tests this year alone, and is rapidly moving toward its goal of developing a nuclear intercontinental ballistic missile (ICBM) capable of targeting the U.S. mainland. The administration of U.S. President Donald Trump has stressed that all options, including military action, are being considered to eliminate what it calls this unacceptable existential nuclear threat from North Korea. In contrast to the Russian representative's conciliatory views on North Korea, other officials at the Seoul Defense Dialogue forum voiced support for imposing more coercive measures against Pyongyang. 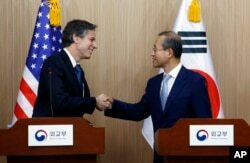 U.S. Deputy Secretary of State Antony Blinken, left, shakes hands with South Korea Vice Foreign Minister Lim Sung-nam after finishing a press conference in Seoul, South Korea, April 19, 2016. Lim Sung-nam, the vice minister of Foreign Affairs for South Korea, said the continued belligerent and threatening behavior of the Kim Jong Un government has convinced the progressive leadership in Seoul to back away from its earlier position advocating for talks and outreach. “Now is not the right time for dialogue, rather it is time to tighten the screws on North Korea with a view to forcing the regime to change its strategic calculation,” he said. Jia Qingguo, a professor of international studies at Peking University in China, categorized North Korea's relentless missile and nuclear tests as “suicidal.” He voiced support for stronger sanctions and proposed the United States, China, Russia, South Korea and Japan engage in five-party talks as North Korea refuses to negotiate. It is time, he said, to discuss all possible contingencies, including what to do if the Kim regime collapses. 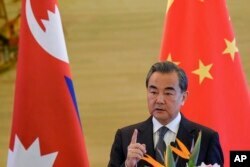 China's Foreign Minister Wang Yi speaks after a meeting with Nepal's Deputy Prime Minister Krishna Bahadur Mahara, Sept. 7, 2017, in Beijing. Chinese Foreign Minister Wang Yi Thursday said the U.N. Security Council should make a further response on North Korea, but that sanctions must be combined with dialogue. The United States asked the U.N. to impose an oil embargo after North Korea's latest and biggest nuclear test. European Union Foreign Policy Chief Federica Mogherini also expressed support Thursday of adopting tougher economic measures to restrain the rapidly growing North Korean nuclear threat.